Generally, when iPhone releases a new update, the new update will be automatically downloaded on your iOS devices when connecting to Wi-Fi. It will not be strange for most iDevice users of the constant irritating reminders and pop-ups of iOS software updates, especially when your iPhone/iPad connecting to Wi-Fi. However, iPhone, iPad or iPod Touch users sometimes do not want to install the updates for full storage space or the existing iOS system is great for them. Anyways, how to delete iOS update (even delete iOS 12 update) on your iPhone/iPad/iPod Touch so as to save storage space or just avoid these nagging pop-ups and notifications? You are right here for it! Open the Settings app on your iPhone and go to “General”. Select “Storage & iCloud Usage”. Locate the nagging iOS software update and tap on it. Tap “Delete Update” and confirm that you want to delete the update. Click on the iOS update and tap "Delete Update" to confirm. Then you will no longer receive the iOS update reminder even when your iPhone/iPad connects to Wi-Fi. How to update in the future? It is also easy to update iOS 12 system if you want in the future. Please make sure your iPhone/iPad is connecting to a Wi-Fi network. Or you cannot download the update. Then click Download and Install option and it will start the update process. 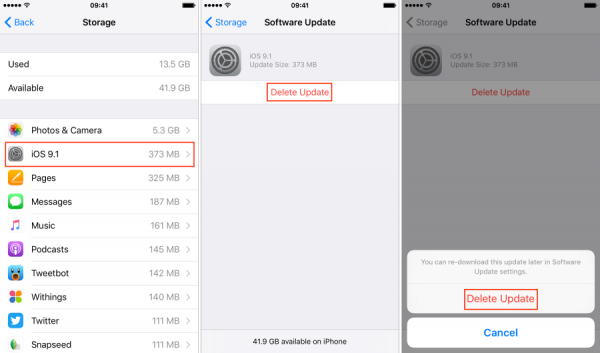 Most iOS users want to delete iOS update because update would occupy much storage space. They believe deleting iOS 10.3/11 update would provide more space for favorite contents. However, generally, the new iOS update would only occupy less than 200 MB which is not so huge, compared with your photos, videos or music. 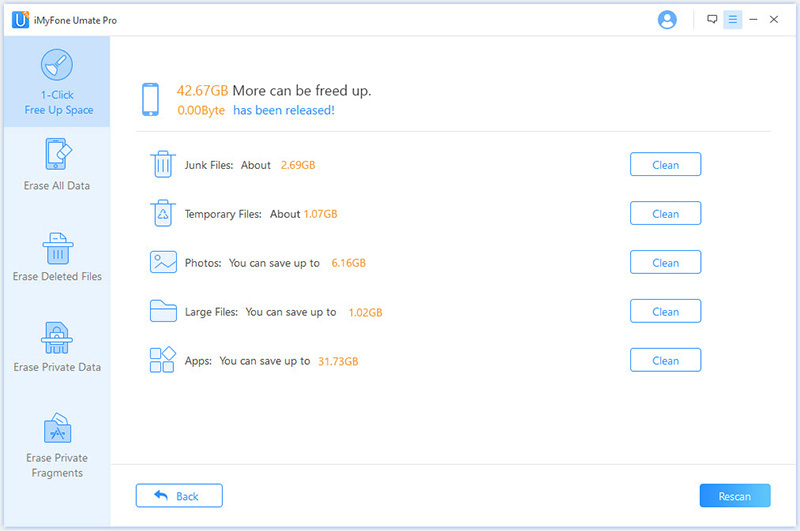 If iOS users need more space, in stead of deleting iOS update, iMyFone iOS Cleaner (iOS 12 supported) can easily bring tons of storage space back. 200 MB is just piece of cake for iMyFone iPhone Cleaner or iMyFone iPhone Cleaner for Mac. Cleaning up storage space is one of the key features of iMyFone Umate Pro iOS Cleaner. As it is regarded as the all-in-one solution for space saving and privacy protection, and permanent erasure is another key feature. 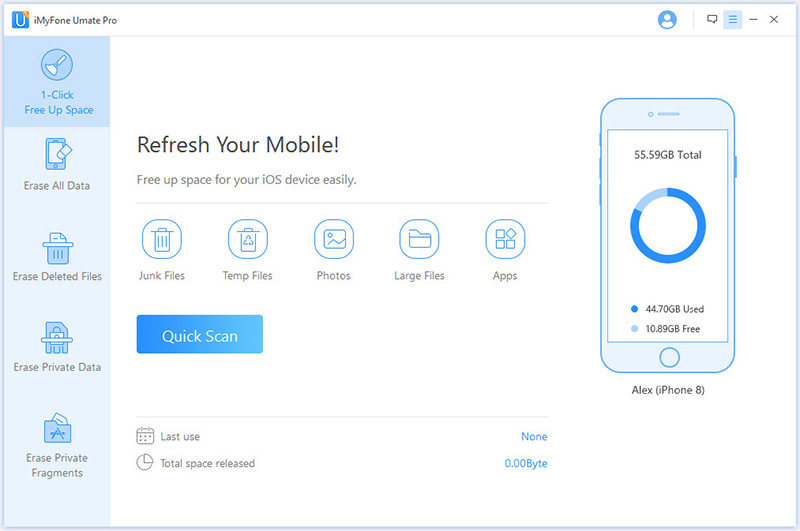 With advanced scanning and operating technologies, 1-click on iMyFone iOS Cleaner make the cleaning process easy and simple and with all the hidden useless files cleanned up, your iOS will run much more faster. Clean as much as 30+ junk files, including cookies, history, logs, corrupted files, account info, etc. This function is totally FREE! Back up to your computer first, then aives you the options to losslessly compress photos or mass delete photos and large files (videos & audios). 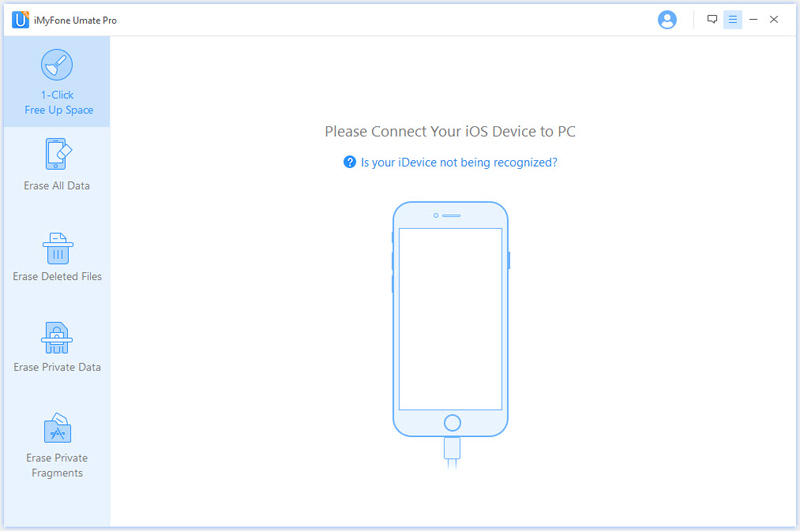 Completely erase everything from iOS device including deleting iOS update and make it as a new one. Find out and permanently erase existing private data and previously deleted files to avoid privacy leak. 1. Download the install iMyFone iOS Cleaner on your Computer. Open the software and connect your iPhone, iPad or iPod Touch to the computer with USB cable. 2. Click 1-Click Free Up Space tab on the left hand side menu and hit Quick Scan on the home screen. When it finishes, it will show you how much space can be freed up. 3. Click Clean button of the specific item, Junk Files, Temporary Files, Photos, Large Files or Apps, then you can preview first and hit Start button to start the cleaning process. When it finishes, it will show you how much space has been cleaned.